Every year the McGill Library welcomes graduate students into the Library to work on various projects for a semester as a part of their studies. This year Digital Initiatives hosted two students: Heather Rogers from the McGill School of Information Studies and Jean-Sebastien Sauvé from Université de Montréal École de bibliothéconomie et des sciences de l’information. Library Matters took a pause with both students to talk about their work at the McGill Library and how their experience may help to inform Library units as they move forward with related projects. 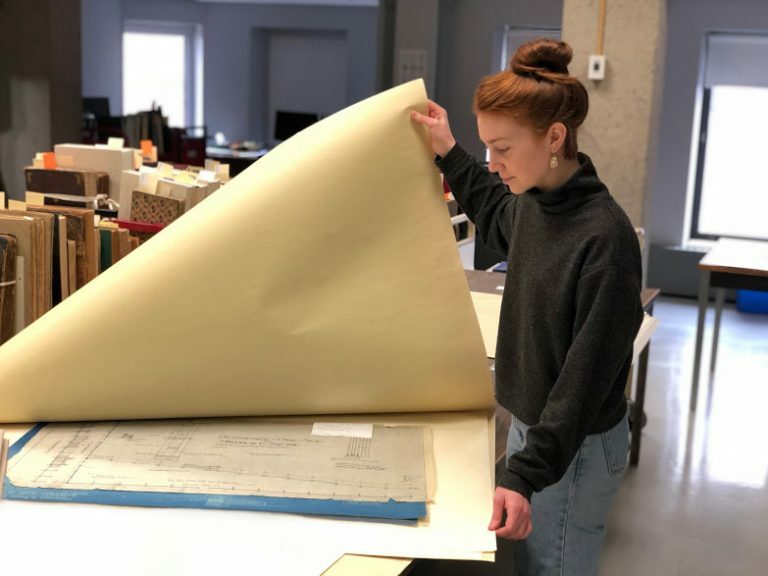 As a part of the McGill School of Information Studies masters of Information Studies program, Heather Rogers opted to do a 100-hour practicum with Digital Library Services and the John Bland Canadian Architecture Collection (CAC) doing research in support of digitization priorities. LM:   Tell us a little bit about your background. What made you want to study information studies? HR: I majored in International Relations and Japanese with a plan to pursue journalism after I graduated. After a one-year internship in New York, I realized that it wasn’t for me and decided to spend a year teaching English in Japan on the JET Programme. I realized that I loved being in the classroom and my life in rural Japan and so one year turned into three. I wanted to get more involved in the community, so I decided to volunteer at a local public library on Saturdays. I got my first experience doing shelving, reader’s advisory, and story time with children. I always knew that I wanted to go to grad school but wasn’t sure what I wanted to study. I started researching how I could get the best of both worlds (teaching and working in a library) and discovered library and information studies master’s programs. LM: Can you briefly describe your practicum? HR: My practicum was centred on the Canadian Architecture Collection (CAC), one of the special collections at McGill. The CAC consists of architectural plans, drawings, and photographs that document how McGill’s campus and the city of Montreal have developed. I was tasked with researching collections within the CAC and collecting information on copyright, past usage, and potential research value to help in for assessments using the new digitization priority matrix. LM:     What do you wish you would’ve known before starting the practicum? HR: Coming in with more familiarity with archives would have been helpful at the beginning, but it was a good learning opportunity and both my supervisors were incredibly supportive. I loved looking at architectural drawings but didn’t know about the different materials they were drawn on or had handled them before. However, spending time in the CAC with librarian Jennifer Garland at the beginning of my practicum was a lot of fun and gave me a great introduction to the work of architects I would be researching later. LM: What skills, lessons and learning moments did you take away from this practicum? HR: The ability to research materials within a collection and pull from different sources to provide a collection assessment was the biggest takeaway from this practicum. It’s such an incredibly important skill that I know I can continue to apply to my work as an academic librarian. Using a digitization priority matrix really guided my research and helped me to look at the different things to consider when assessing a special collection. The biggest lesson that was specific to my practicum that the creation of architectural plans and drawings can be attributed to the firm and not just a single architect. Looking at who the creator was and the date it was done was always step one of whether or not to go through with the full collection assessment. I learned a lot about Canadian copyright and how to determine whether something was in the public domain. LM:   Did you have an “aha!” moment? HR: The biggest ‘aha’ moment was going from just researching the collections to looking at collection assessments as a way to find links to the collections in other cultural heritage institutions. For academic libraries, special collections can be used to create partnerships with other universities that have related materials so once I got into the mindset of how to look for those links, it informed how I conducted my research for the collection assessments and thought about how the materials within the CAC can be digitized not only for the McGill community but for other cultural heritage institutions. LM:     Anything else you want to mention? HR: This practicum was such a great experience working with a special collection and learning about the different ways a university can make unique materials available and accessible to students and faculty. It also cemented for me the plan that working in an academic library was the path I wanted to pursue. LM: What made you want to study information studies? JSS: Information studies came into my life after a long journey! I first did my BA and MA at McGill before being awarded a SHHRC scholarship to move to Germany to get a PhD in Architectural history. After eight years in Germany, I came back to Montreal for an SSHRC-funded postdoctoral fellowship at the Canada Research Chair on Urban heritage at ESG-UQAM with Prof. Luc Noppen. As a researcher, I enjoyed handling and appraising precious material and sharing discoveries. Through these contacts, I became more and more interested in libraries and archives as cultural and educational institutions. I, therefore, decided to enrol in the MISt program at EBSI (Université de Montréal) to further explore these issues. I am thrilled seeing all these possibilities offered by working as a librarian. I would have never expected this. This is enormously gratifying since, in the end, you help people going further in their research or study. LM: Can you briefly describe your practicum? 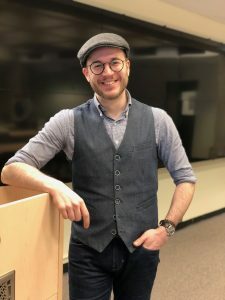 JSS: Since I wanted to further explore issues related to the Digital humanities and Open Access, I met Sarah Severson and Jenn Riley from McGill Digital Initiatives. They gave me the mandate to set up a crowdsourcing project on the platform Zooniverse (www.zooniverse.org) to see if this sourcing model is efficient for faculty members and students in their research projects or if it can be used to appraise and disseminate objects from the library collection. With the collaboration of librarian Jennifer Garland, Rare Books and Special Collections, we selected a set of black and white photographs from the John Bland Canadian Architecture Collection taken in the first half of the 20th century by Ramsay Traquair (1874–1952) who was a professor at McGill School of Architecture. These photographs depict old silverware from different churches and institutions in Québec, and include written captions that were not fully transcribed in our existing database, and selected silver mark drawings that were as yet unidentified. We thus decided to create the project The Old Silver of Québec (after Traquair’s 1940 book title) to ask volunteers to help us transcribe the captions and identify silver marks with the help of Traquair’s book. Each picture would be shown to 3 different volunteers and their answers would be compiled, and the best transcription/identification would be then proposed to the cataloguing librarians to help enhance their records in our archival collections catalogue. Since this was a pilot to help us learn, we went through the testing phases that made us change the tutorials, the overall content or even the tasks. Through all the observations I have done, I wrote a technical report as well as a list of good practices and guidelines while undertaking a research project. LM: Your practicum was one semester long. Was it enough time to accomplish what you had hoped for? Most of it, fortunately! 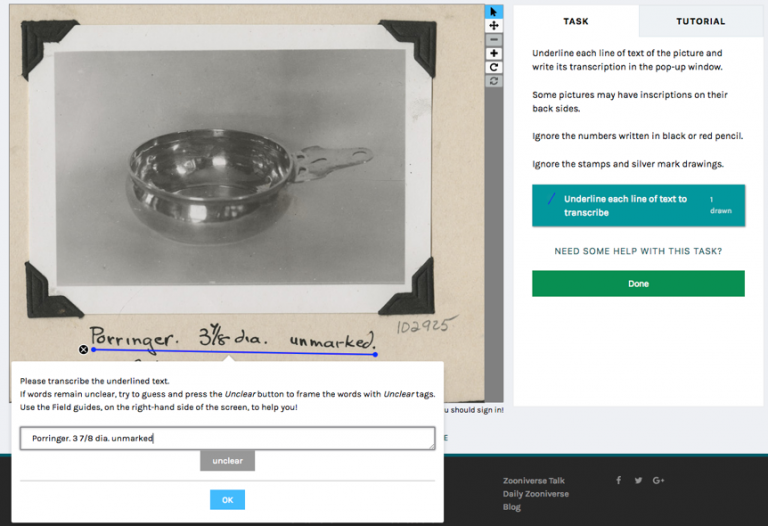 We were able to test the platform with the library staff, McGill students, and Zooniverse volunteers (it was sent to more than 1,000 people) to get feedback about the workflows and the interest towards the objects. As for now, more than 90 volunteers have fulfilled more than 50% of all tasks. 70% of all captions have been transcribed, while 33% of the silver marks have been identified. This is a huge success since the project remained not publicly visible. LM: What do you wish you would’ve known before starting the practicum? JSS: Since it was an intensive 35-day practicum, I made full use of the experience with research project management from my previous life as an architectural historian! But I wish I had a better knowledge of the institutional culture prevailing within an academic library. I know university libraries from a user’s perspective or from my work as a reference librarian at ÉTS. But throughout my studies, we rarely had the opportunity to talk about university libraries, their structure, and their special needs. LM: Did you have an “aha!” moment? JSS: Setting a crowdsourcing project remains very abstract until one gets the data produced by the volunteers. As I downloaded the data spreadsheet from Zooniverse and saw how that answers were on the sheet (messy data), I felt that the project was fulfilling its mission. It became even more obvious as I started to clean the data and extracted the elements of answers we were looking for. But as I looked further at those answers, I saw some flaws that I have never expected: some people wrote words in different sequences, typos were made, and, most of all, some answers were impossible to compare! LM: What was the feedback like from Library staff? Will the work you focused onbecontinued? JSS: I think the project generated a genuine interest among members of the library staff: many people have tried to transcribe captions and to identify the silver marks. I have also received very useful comments and feedback. According to my Digital Initiatives supervisors, there is still interest to explore crowdsourcing projects further. I am very happy to see that my contribution to the project is useful and that crowdsourcing will be carried on at McGill!